Mr.Lite is a manufacturer with a broad selection of lights, here I am taking a look on a stainless steel light. 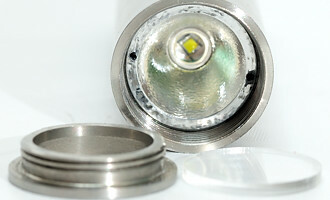 This light is a smooth tube in shape and uses the full Mr.Lite user interface (See below). I received only the light, no box or accessories was supplied for the review. 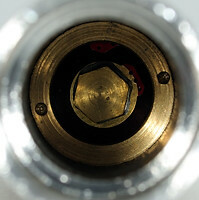 It is possible to open the front of the light. 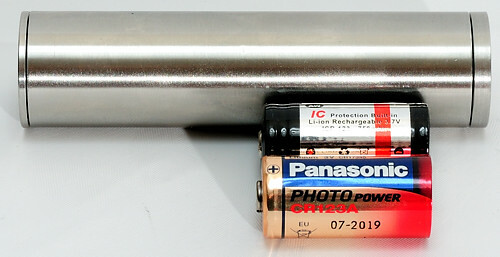 Looking into the battery tube, the connection for the battery + pole can be seen, it is a solid piece of metal. 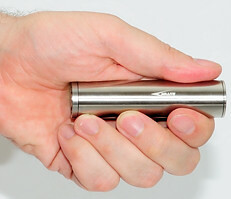 The stainless steel body has a discrete Mr.Lite marking on it. That is the only marking on the light. The tail has a reverse switch with a stainless steel button. It is a long tailcap and the treads on the tailcap are very nicely done and works smooth. The inside of the tailcap has a spring with a cap on for connection to the battery, again very nicely done. The standard user interface has lots of settings, but is missing a real low. This light is a solid stainless steel light and can probably take just about any kind of abuse (Not tested). The build quality and finish is good, but the brightness is not in the top range. The long list of modes in two groups is also a minus for me. The driver is designed to work on CR123 batteries, but the light will also work on LiIon batteries. I have collected all modes in a table. For the brightness I used a luxmeter and then scaled the values, the pwm is measured with my oscilloscope and a light sensor, the current with my DMM on peak/average (Fluke 289). For the estimated runtime I have take the current measurements and divided into 1.4 (i.e. a 1400 mAh battery), this is a very rough estimate. Doing a voltage sweep and recording current and brightness shows that the light has a stable light output with CR123 batteries, but LiIon has to high voltage, it will go into direct drive. 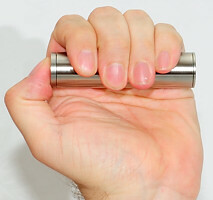 Because this light is running at a low power level (Around 1.5 watt from 1.7 to 3.9 volt and 2.5 watt at 4.2 volt), this helps keep the led at safe temperature with the bad heat transfer of stainless steel. 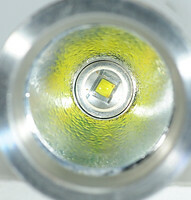 This power levels also means that the light cannot reach the specified 230 lumen. I did not do any runtime with CR123 batteries, they would be long and flat, instead I have done some with LiIon. The first part of the run is with direct drive. Later on when the battery voltage gets low enough, the regulation kicks in and keep the brightness stabilized until the battery is empty. The light uses pwm at 280 Hz to regulate the light, but looking at the signal it contains other frequencies from the converter. The above trace is from low brightness (10% pwm). #3 brightness with 60% pwm. High brightness with 98% pwm. SOS uses a 0.5 second unit, it takes 13.5 seconds to send a sos and there is a 53 second pause between transmissions. The only difference between the two sos settings is the brightness. The standby selection has a 0.05 second flash each 8.7 second. Beamshots and a comparison to other lights can be found here.